This article is sponsored by Adirondack Winery. A chance to drink refreshing berry flavored wine and raise money for breast cancer at the same time? Count us in! 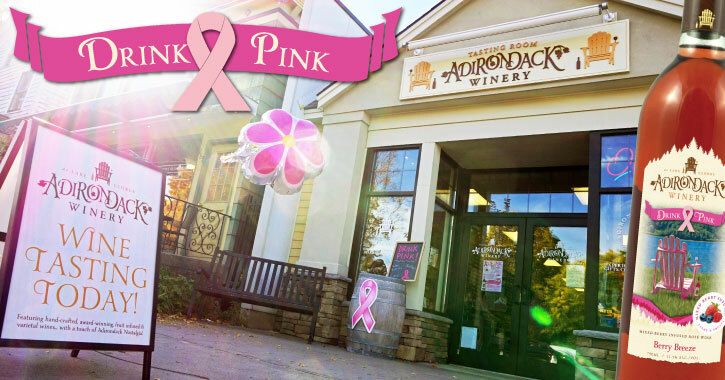 The Adirondack Chapter of the American Cancer Society has named Adirondack Winery as the flagship sponsor of this year’s Making Strides Against Breast Cancer campaign in October. Last year, as 2017’s top ranking company team in the Adirondacks, the winery raised $6,000 towards the cause through an annual month-long fundraising initiative they aptly named Drink Pink. This year, the 6th annual for Drink Pink, Adirondack Winery has put together an incredible variety of ways you can support breast cancer research and help the winery raise $6,500 to achieve their goal, and beat last year’s total. Read below to check out all the ways you can get in on all the Drink Pink action, including two different and delicious pink wines, a raffle, fun events, a 3K and more. The two wines specifically labeled for the Drink Pink campaign are Drink Pink Berry Blush and Drink Pink Berry Breeze. Four dollars from every bottle sold in October is donated to the cause. Drink Pink Berry Blush is a sweet, raspberry-infused wine that is blended with fresh floral notes and offers a soft finish. Drink Pink Berry Breeze is a semi-sweet wine that includes flavors of fresh strawberries, raspberries, and blueberries and it ends with a smooth finish. Drink Pink Berry Blush is available for purchase only online and at Adirondack Winery headquarters at 395 Big Bay Road in Queensbury; Drink Pink Berry Breeze is available at either of Adirondack Winery’s tasting rooms, listed below, or online. Drink Pink Weekend is happening at Adirondack Winery Friday, October 12th through Sunday, October 14th. Festivities include a free Drink Pink wine cocktail at the door, $5 pink wine slushies all weekend, special themed Wine Tasting Packages with locally made wines and foods, and a number of games and prizes. Games include a Wine Bottle Ring Toss, Giant Jenga, Spin the Wheel, Guess the Corks, and more. Adirondack Winery has two tasting rooms: on Canada Street in Lake George, and on Lake Shore Drive in Bolton Landing. In addition to special drinks, wine tasting packages, and games happening at each tasting room there will also be Drink Pink Uncork & Craft events at both locations. Adirondack Winery is donating $10 per ticket sold to Making Strides. Wine Glass Candle Making is happening on October 5th and the 19th with guest instructors from Wax n’ Wix, and Wine Glass Painting Parties are taking place on October 12th and the 26th with a guest instructor from ADK Creative Works. 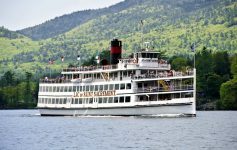 The October 5th event is taking place at the Bolton Landing location; the other three are in Lake George. Drink Pink Raffle Baskets include a number of goodies from local businesses and vendors, and you can find these baskets at the tasting rooms throughout October. The total value of each basket is over $500! 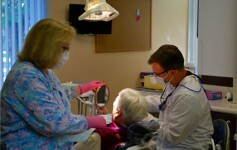 Businesses that donated items to these baskets include Adirondack Brewery, Lake George Distilling, Lake George Steamboat Company, Fort William Henry Resort, and others. Special pink merchandise will be sold at the Adirondack Winery tasting rooms and online throughout October. A portion of each item sold will be donated to Making Strides. The final way you can participate in Drink Pink is by joining the Adirondack Winery Making Strides Team to help them generate donations. Customers, friends, and family of the staff are all getting in on the Making Strides 3K, scheduled for October 28th at the Cool Insuring Arena in Glens Falls. This is an easy walk that starts at 12pm, although Adirondack Winery will be there at 10am to get everyone in the Drink Pink mood. Even if you’re unable to walk at the actual event, you can still join the team and participate by donating to their team page. The Drink Pink wine sales, tastings, raffle baskets, and events are happening throughout October. Make sure to take some time during the month to make a purchase or check out an event, and join Adirondack Winery in this admirable fundraising effort. Let’s help them get to that $6,500!